It’s time for another installment of Title Pages, featuring another title page from my run on The Batman Strikes! 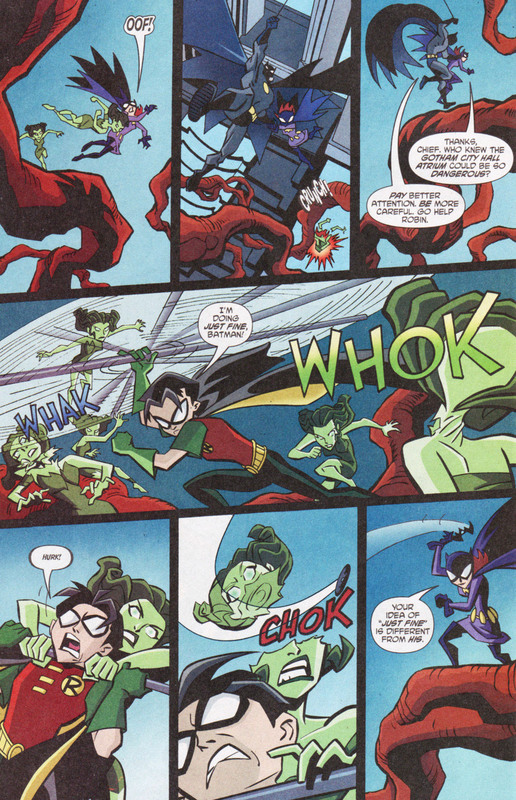 which was a tie-in comic for The Batman animated TV series. A Title Page is the page which features the story title and credits for the issue, and is often (but not always) a Splash Page, which is a full-page image, rather than a page broken up into multiple panels. In The Batman Strikes! #17, Chief Angel Rojas was still the top cop in Gotham City. By issue #18, Police Commissioner James Gordon has arrived on the scene, and with him his daughter Barbara Gordon, aka Batgirl! 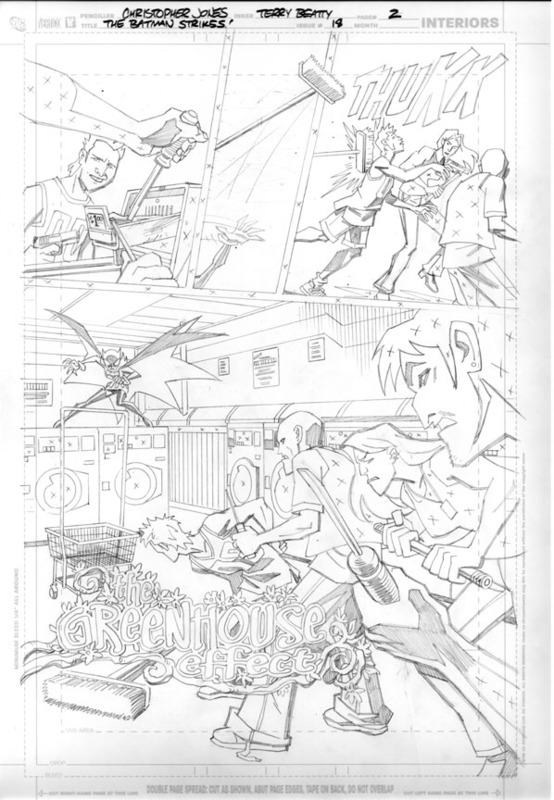 Again the title page was page 2, so here’s the set up on page 1, where Commissioner Gordon is working late an checking on the whereabouts of his daughter, who happens to be dealing out justice (with the help of a handy push broom) to some low-level street thugs trying to rip off a 24-hour laundromat. I’ve always seen Gordon as very blue-color and overworked, so I enjoyed drawing him illuminated only by his desk lamp in a darkened office. Seeing his name reversed and backlit in the window of his office door was another fun touch. The Gotham City Map seen on the finished page was not rendered by me, but was an existing map of Gotham I found online, and I sized and angled it to fit into the artwork and provided it separately to inker Terry Beatty for him to paste into place once the original art was inked. Note that we’re showing Batgirl on her cell phone here, but saving a good look at her for the big reveal on the next page. So here’s the title page and our reveal of Batgirl as she doesn’t let being outnumbered intimidate her in the slightest, even in these early days of her crime-fighting career. If you compare the pencils to the finished page, you can see that she disappears into her cape a little bit. This was again due to the dark, saturated colors in combination with the cheaper paper used on this series as I’ve lamented about before. 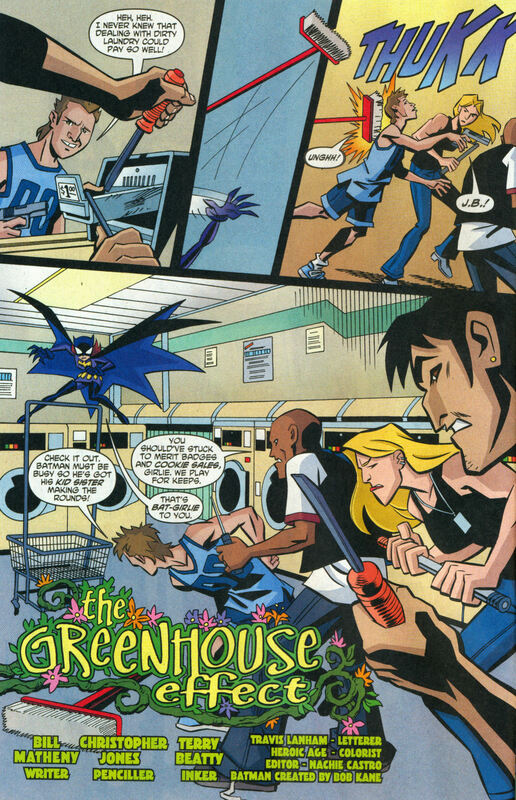 Consider it part of my ongoing crusade for DC to make digital editions of all the issues of this series available. So far they’ve only released the first three issues digitally! While not appearing in this scene, the villain of the issue was Poison Ivy, and given the title of the story, I tried to give the title logo a decorative, floral approach. I like how it turned out. I’ll have more installments of Title Pages soon, but until then you can check out previous installments! As always, questions and comments are welcome! I was always a little surprised that we got away with that one in a Johnny DC title. Granted, it’s a plant simulacrum of Poison Ivy and not the real flesh and blood original, but STILL! Inks by Terry Beatty. Colors by Heroic Age Studio. The Batman Strikes! | Christopher Jones | October 20, 2011 11:06 am | Comments Off on Happy Halloween semi-decapitation! Time for a look at more hand-drawn logos from title pages, this time looking at two more issues of The Batman Strikes! This one was simple enough – with a short title and a leaping Batman figure, I thought I’d try to work the title into the highlighting on Batman’s cape. I assumed, therefore, that the logo would appear in blue. Also, I tried to create the letters in swooping, curving shapes as to compliment the flowing cape. Huh, yellow. Who’d-a thunk it? Still, I think the logo and the page work well. This one had a pretty straight-forward logo: Hand-rendered letters based on a typeface called Whoopass. Because I wasn’t leaving this for the letterer to typeset, I could position everything as to make sure that the ears of the Batman figure beneath the logo crossed the letters so as to not be lost against the black background. Here’s the full page. I wish there had been a little more contrast between the colors used on Batman’s cape and the palate of that first inset panel, or that a darker background color had been used in that third panel, but I’m still very fond of this page. I love framing panels artistically like this, even though this kind of thing usually has to be saved for introductory pages like this one or special sequences like flashbacks or montages. Click on any of the images to visit my gallery where you can find more title pages and see the pages in higher resolution. Young Justice 9 is out TODAY! Captain Atom wants YOU to run (yes RUN!) to your local comc shop to pick up the newest issue of Young Justice out today (#9), beginning a new storyline featuring the good Captain and with a story by Greg Weisman and Kevin Hopps. Young Justice | Christopher Jones | 9:51 am | Comments Off on Young Justice 9 is out TODAY! Never give the Riddler one of those puzzle boxes from Hellraiser. There’s just nothing good that’s going to come of that. 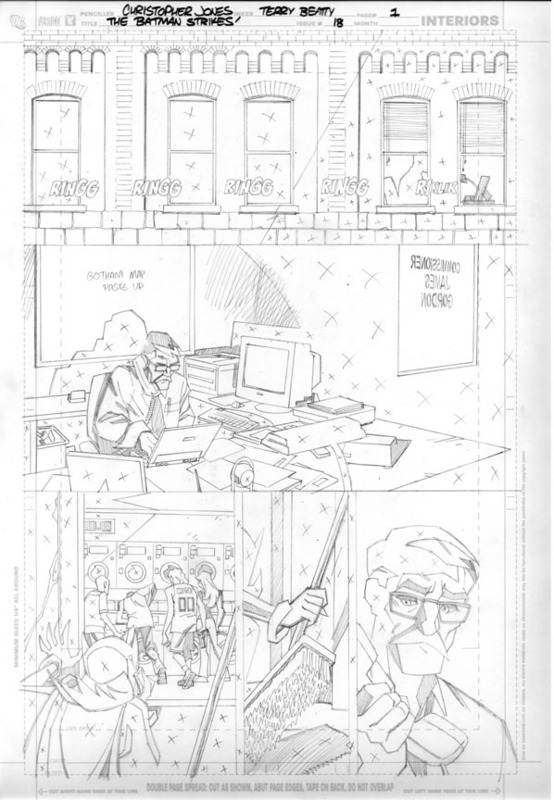 This is another page from The Batman Strikes #50, the final issue of the series. I was really happy with how this page turned out – nicely moody and transcending the cartooniness of the animation designs. Pencils by me, inks by Terry Beatty, color by Heroic Age Studios. The Batman Strikes! | Christopher Jones | October 17, 2011 6:00 pm | Comments Off on Riddle me this… PINHEAD!